ISLAMABAD, Pakistan - The lawyer of a Pakistani woman allegedly stoned to death by her own family gave more details of the brutal killing Friday, as authorities scrambled to deal with a surge of international outrage surrounding the case. Farzana Parveen was killed by a mob – including her own father - outside a courthouse in Lahore because she did not marry the man her family had chosen, her lawyer said. "The attack happened suddenly," Ghulam Mustafa Khar told NBC News. "There were a lot of police around, more than normal, as the incident was near a gate exclusively used by police officers to enter and exit the courts. "It was a brawl of around 30 people, it went on for 15 minutes or so. I didn't interfere, nobody did. The police were outnumbering the mob, but even they didn't intervene. Their intervention could have definitely saved her." The 25-year-old woman was on her way to court to challenge charges that she had eloped with her husband, Mohammad Iqbal, rather than the man chosen by her family. She was three months pregnant at the time of the attack on Tuesday, according to her husband, but there has been no autopsy to confirm this. The incident prompted international outrage from rights groups and United Nations officials. Pakistani Prime Minister Nawaz Sharif branded it a "brutal killing" and "totally unacceptable," but the reaction in the country has been muted. 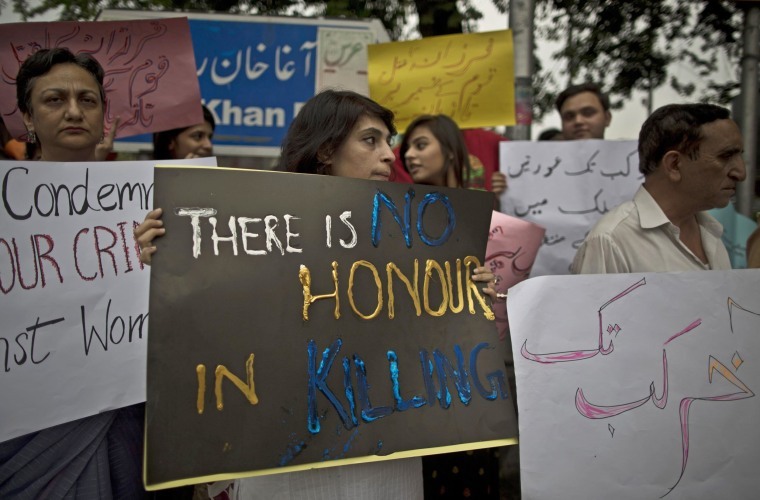 Parveen's lawyer alleges that the murder was what is known in Pakistan as an "honor killing," where female family members are murdered because the family feels they have "dishonored" their values and traditions. In this case, Parveen was said to have been killed because she chose to marry a man she loved rather than the one chosen by her parents. Pakistan has sought to curb this practice by passing several laws. But legal loopholes as well as a feudal-style culture continue to perpetuate the killings, even in developed and educated parts of the country like the Punjab where this attack occurred. "I do not even wish to use the phrase honor killing," said U.N. High Commissioner for Human Rights Navi Pillay in a statement in Geneva Thursday. "There is not the faintest vestige of honor in killing a woman in this way." Lahore police officers have been criticized for allegedly standing by and watching while the woman was murdered. But on Friday, a senior official in the Punjab province's government sent a police report to NBC News that rebutted several of the details, and presented new evidence that appeared to downplay initial accounts of the killing. "The brick that killed the girl was picked up from the roadside"
The police report said Parveen was already married to Mazhar Hussain, the man her family had chosen for her and one of the suspects involved in her killing. It said she lived with him for several months before eloping with Mohammad Iqbal, which led to a criminal case being brought against her. "As per the Pakistani law, she [should] not have done this," it said. Police also denied that she had been stoned, and instead said she was killed in a scuffle involving "both parties." "The brick that killed the girl was picked up from the roadside and was most probably hit in the heat of the moment by her brothers," the police assessment said. "There was no stoning to death as has been misreported in media." It also said the killing happened a few hundred feet away from the court, where there was no police deployment. Iqbal's lawyer said the woman was indeed dragged away to another road, but insisted police could have prevented her death. There were also reports Thursday that Iqbal had killed his first wife. The provincial Chief Minister of Punjab, Shahbaz Sharif, issued a statement Friday saying Parveen's death in the presence of police was "regrettable" and promising those responsible would be arrested "in 24 hours." NBC News' Alexander Smith contributed to this report from London.